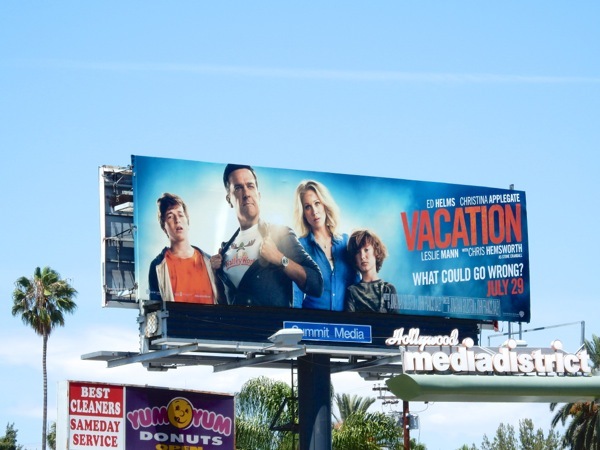 Chevy Chase and Beverly D'Angelo's sitcom pilot, Chev & Bev, may not have been picked up by ABC as a new Fall series, but the 'Griswold' legacy lives on in a brand new movie reboot, Vacation. The National Lampoon's Vacation stars reprise their roles as 'Clark and Ellen Griswold', the parents of Ed Helms grown-up 'Rusty Griswold', who decides to surprise his own family with a cross-country road trip to spice things up with his wife (Christina Applegate) and reconnect with his two sons, heading to 'Walley World' before the infamous amusement park closes its doors for the last time. As you can imagine, in grand Griswold family tradition, things don't go exactly as planned. 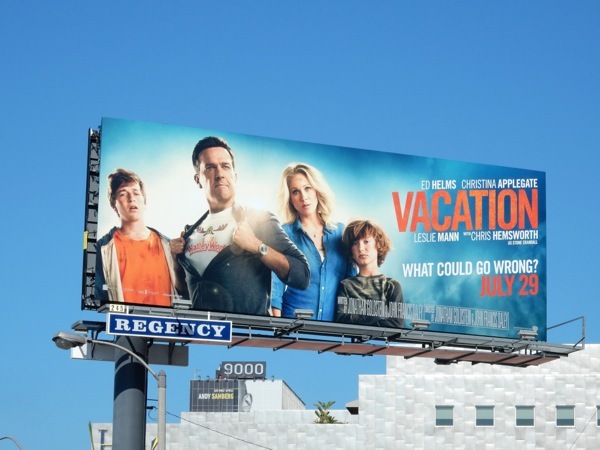 These Vacation movie billboards, with Ed Helms proudly displaying his Walley World shirt in an homage to Superman, were first spied along West Hollywood's Sunset Strip on June 23, then photographed later along Melrose Avenue and Highland Avenue on July 2, 2015. 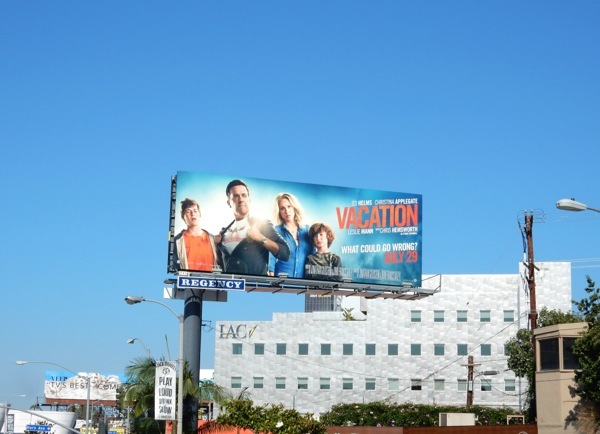 If you're a fan of Ed Helms, you can also check him out in these billboards for The Hangover movies. What could go wrong they ask? That this could be a totally unnecessary remake of the 1983 original, so let's hope there's enough new laughs for a new generation. 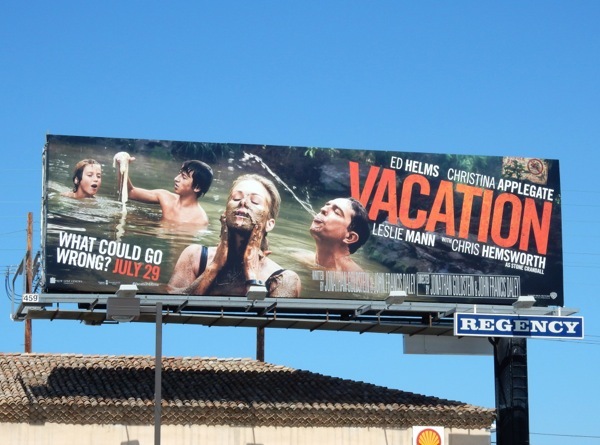 UPDATED: Here's another far funnier ad creative for the new Vacation movie, especially when you know the context of the scene. 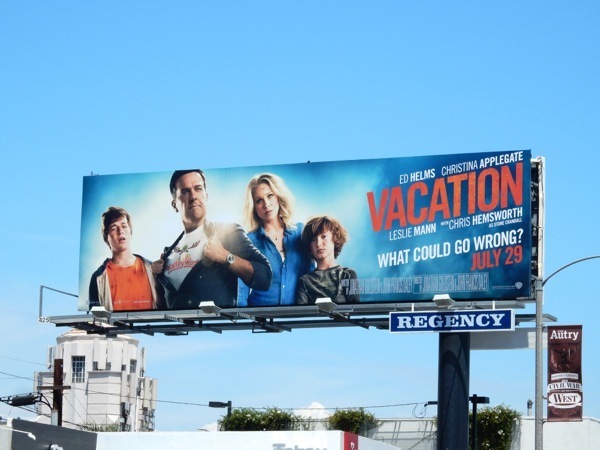 In this billboard snapped along Fairfax Avenue on July 9, 2015, the Griswold family think they're enjoying the delights of natural hot springs, only to discover they are swimming in raw sewage. What could go wrong? Apparently the very worst. 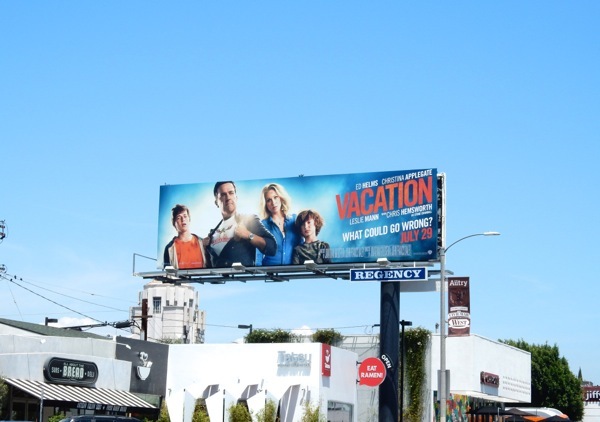 And here's the same cringeworthy creative spied at the busy intersection of Fairfax Avenue and Beverly Boulevard. Be sure to also check out the new Griswold family car, the Tartan Prancer from Vacation, on display at ArcLight Hollywood cinema.